Bunkers, hidden agendas, missiles and fear. Walking these historical sites, we took note of the postings offering bare minimums of informational facts. A few photos, dates and names of the sites. It was so unsatisfactory. This place had been fortified and occupied full time with state of the art weapons for their era, and yet no explanations for why was being offered. We did read a common term, “the cold war”. Even the older sites did not mention the “why” but merely stated facts for how far out into the bay the weapons could be fired. One of these bunkers was accessible thanks to someone who had cut through the bars on a window. I explored within and put my hands on the crumbling cement walls, trying to imagine the conversations from long ago. Electrical connections still hung from the ceiling and lay upon the floor. Large bolts remained from heavy machinery now gone. Seeing the extent of graffiti, it was obvious our own generation had wanted to leave their signatures noting they had been here too. 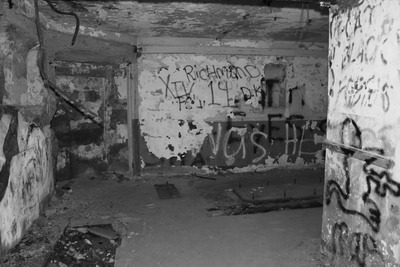 All I could think was how I’d hope my life would amount to more than spray paint inside of some forgotten bunker. I want my signature in this life to mean that others would live on into eternity; a place without bunkers or arsenals.